CEO Kringle: Polar Toy Giant "On Brink"
Kringle and UET union president Binky McGiggles presented a draft emergency bailout plan to the committee calling for US $18 trillion in federal grants, loan guarantees, and sugarplum gumdrops that they said would keep the company solvent through December 26. "We believe this proposal shows that management and labor can work together to craft a reasonable, financially responsible short-term survival plan," said McGiggles. "After the new Congress is seated in January, we would be happy to return to present a long-term package to get us through April." Kringle warned that failure to approve the plan would have dire global economic consequences. "Oh goodness," said an emotional Kringle, fumbling with his glasses, "think of all the children who will wake up sad and angry and confused on Christmas morning, with nothing in their stockings. Let's just say I wouldn't want to be their parents. Or a someone answering your switchboards on December 26." SantaCorp, which lost over $2 trillion in FY 2007, has seen a steady erosion in market share and profitability over the last five years. Industry analysts say that its precarious position is due to a number of factors. "You might say it's a perfect snowstorm," said Merrill Lynch analyst Jennifer Rothstein. "The youth consumer market is demanding more for less, at a time when the government and courts have forced SantaCorp to lower its 'good list' credit rating standards. They face increased non-union competition from the East Pole, and huge increases in fuel prices for magical reindeer flying hay. It's a hard sell for the investment community." Veteran market watcher Charles Kessler of ToyWeek said SantaCorp's labor cost structure was a significant factor in its recent struggles. "After the 1982 strike SantaCorp offered the UET a generous pension plan promising free lifetime candy canes and unicorns," explained Kessler. "It seemed like a good idea at the time, but the company accountants forgot to factor in elf immortality." Despite the dire picture painted by Kringle and union officials, they encountered skeptical questioning from some committee members. Several members slammed the SantaCorp officials for flying to the hearing on a private luxury sleigh, while others openly questioned the company's business model. "Almost every business in my district has had to adjust to the new economic climate, but SantaCorp seems to believe it can continue with the same old profligate giveaway business-as-usual," said Paul Ryan (R-Wisconsin). "I'm sorry for your situation, but it is difficult to justify giving trillions of US taxpayer dollars to a private company that is outmoded, headquartered offshore, and, frankly, imaginary." Kringle defended the company's business practices and his reported 4 billion cookie annual salary, saying that the company was "doing the best we can under trying circumstances." He also blamed the company's struggles in part on federal environmental and safety regulations. "Frankly the amount of paperwork you require is astronomical," said Kringle. "OSHA inspections and reporting requirements have doubled our factory production cycle, and every time I tramp a little fireplace soot into a living room I have to fill out three separate EPA environmental impact reports." Kringle also urged the committee to enact industry tort protections, saying that the company remained saddled with crushing legal and insurance bills following the landmark 1974 class action liability case Nader v. Jarts, Clackers, SantaCorp, et al. UET President McGiggles warned that failure to pass a bailout package would have dire social consequences. "All of you have seen the bleak pictures of how plant layoffs have already effected ToyTown -- the boarded-up gingerbread houses covered in frosting grafitti, the abandoned sleighs up on blocks, the widespread crime and sucrose abuse, the antler-wielding gangs of unemployed reindeer yearlings," said McGiggles. "That is only a hint of what is to come if the plant shuts down. If you think an industry bailout is expensive, well, just consider the cost of a full-scale violent rioting by millions of desperate unemployed elves, with warehouses full of surplus BB guns." House Ways and Means committee chairman Charles Rangel (D-New York) motioned to end the hearings, saying that with only 7 bailout shopping days before Christmas the committee needed to move on to other industries facing emergency financial crises. "The American economy and Christmas itself stand on the edge of disaster, It's time for my colleagues show we are good boys and girls," said Rangel, who is reported to have received over $6 million in campaign contributions from SantaCorp and the UET over the last two years. A full House vote on the SantaCorp is scheduled Friday morning, where it is expected to pass by a comfortable margin. President Bush has pledged to sign any and all bailout request from Congress until the end of his term, "no queshnions ast." "I want to insurer the American People and the evil doers that I and the Crongress and the Hankster [Treasury Sec. Paulsen] and Big Ben [possibly Fed Chair Bernanke] and [unintelligible] and me are unineted together to approve the financial aid and regulations and federal takeovers to get our American free ennerpise system back on track," said the President, speaking from inside his new shoe-proof plexiglas enclosure. In concluding the hearings, Rangel gave the SantaCorp officials a personal vote of confidence. 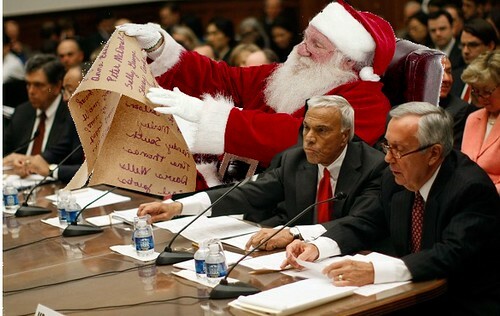 "We believe in you, Santa," said Rangel, handing Kringle what appeared to be a list. "As long as you continue to believe in us."